Elf on the Shelf Classroom Ideas Video and Linky Party! My partner teacher and I are getting ready to use the Elf on the Shelf in our classroom for the first time – so exciting!! So, of course after doing my research, I had to make a video in my investigation to help out novice teachers like myself. Enjoy and please subscribe while you are there! 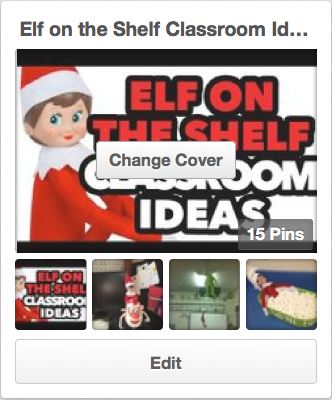 I have also made a Pinterest board dedicated solely to teacher ideas for using elf on the shelf in the classroom (click the image to follow). 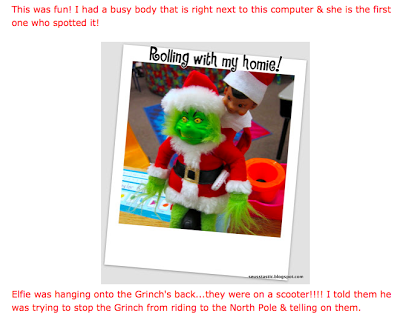 If you are looking for the best Elf on the Shelf classroom pics ever, you definitely have to check out Mel’s amazing post at the Seusstastic blog. She also has a linky party, so link up there, too, after you link up here! Hey, our little elf rolled our classroom without toilet paper last year and it was a BIG mess! Ha! That is awesome! We have our own bathroom, so I will definitely have to add that! Thanks! Christmas has always been a family celebration in the Grinkmeyer home, but as our children grew older we found that their interest in Christmas morning waned and the sparkle in their eyes was gone. The day after Thanksgiving, 1992, we introduced the Christmas Web in our home with the placement of Magic Wands into their socks that had for years been hung at the fireplace mantel. Attached to each Magic Wand was a piece of yarn (a 70 yard piece of yarn). When our two teen-aged children came down Christmas morning, they found that the yarn was wound through the house – around window latches, door knobs, chairs and doors. It ended in a closet or cabinet which held their special Christmas gift from one of Santa’s elves, an elf that had been looking out for them for the past year and knew of their desire for this special Christmas gift. The Christmas Web continued as each of our children got married and as they had children. Each of our grandchildren have an Elf on the Shelf or Elf Magic elf who is now the elf that hides their special Christmas gift each year and leads them to it with their individual Magic Wand. We now have seven Magic Wands each with 70 yards of yarn winding through our house every Christmas morning, making getting a cup of coffee an acrobatic achievement before the winding hunt begins. That. Is. awesome! What an adorable idea! I could definitely see the string ideas working in my classroom. A little chaotic, but sounds like it would be super fun!! Thanks for sharing!!! Thank you, Sandy! You're the best! Love your ideas!! Love your ideas and board. One of my favorite things to do with my elf "Ginger", is to put her in my Gum all machine(this actually holds erasers). My students cannot seem to figure out how she got there! Check out my blog. I think I have other pictures of where she's been in my classroom. That is so cute! And especially the gumball machine! I will have to get a hold of one of those one day! Thank you for sharing, Sharon! Love all the cute ideas you shared! I can't wait to bring my elf out again! On the first day of December last year my elf was sitting with the Elf on the Shelf book wrapped in his lap under a bare Christmas tree. I had the students write him letters and they all asked for him to bring decorations for the tree. So on the second day he brought ornaments. Then the kids decided there was still something missing so they asked him for a tree topper. The next morning the students came into the room and he was repelling from the ceiling hanging the tree topper. Here's a picture. They were hysterical and by the end of the day half of the teachers had been in my room to see the repelling elf. That is awesome! What a cool picture! You have a very thoughtful elf. 😉 Thanks for sharing, Veronica! Your ideas about christmas gift are really awesome and i like those ideas and our opportunity for London retailer and we provide them christmas ideas for kids at wholesale prices.